New Shop Hours For Your Shopping Convenience! Shop Address: 39a Neilson St, Onehunga. Phone (09) 634 5005 or visit our Shopping Website and shop 24/7 at your leisure. 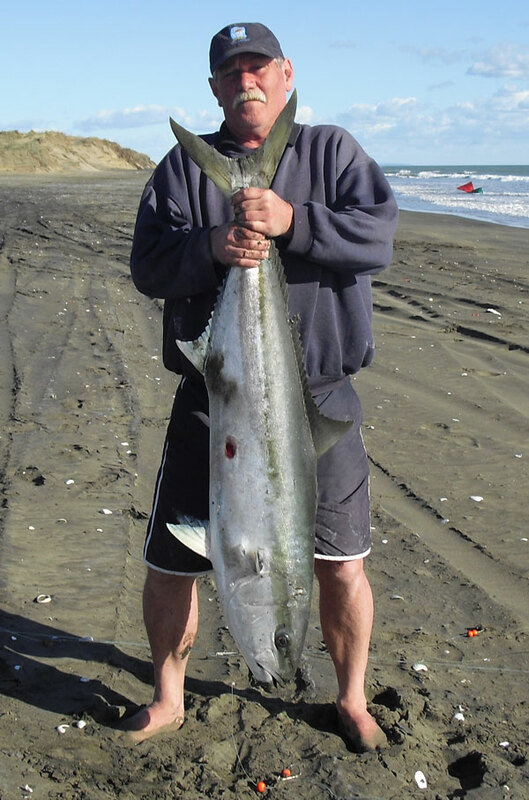 Rob Nelson from the shop fished Muriwai beach on Sunday, October 31st. 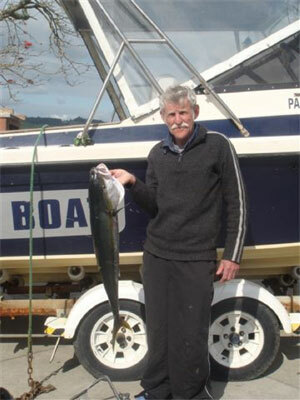 He was using a 65kg Dropper Rig and baiting up his 5/0 Target Floating Bead Traces with fresh saltwater mullet. Undoubtedly the highlight of Rob’s day was landing the huge kingfish below that he reckoned would have weighed well over 40lb. The length was 1130cm from the nose to the V in the tail and many fishers on the beach estimated it to be around 20 to 25kg because it was so fat! Incidentally, this was Rob’s first ever kite caught kingi and he still hasn’t gotten over the thrill! He also managed to haul in this very nice 25lb snapper below. Rob set his Dropper Rig with a Nighthawk Kite and Large Skyhook and the kites stayed up all day in the prevailing light southeast breezes. He put in a huge effort for the day running a total of five sets of 20 hooks. Rob's total catch was 10 gurnard, two of these were released as they were a little on the small side, nine kahawai, three of these were used for bait, eight snapper, five of which were released, despite being legal size, and the massive kingfish caught just before high tide on last set of the day. In Rob’s opinion the number of fish caught was not that good considering the number of hooks he set, but the massive kingi and big snapper certainly made up for the low catch rates. The schooling season has well and truly begun and big snapper are in close off the beaches! Great reports are flooding in from many areas around the North Island. 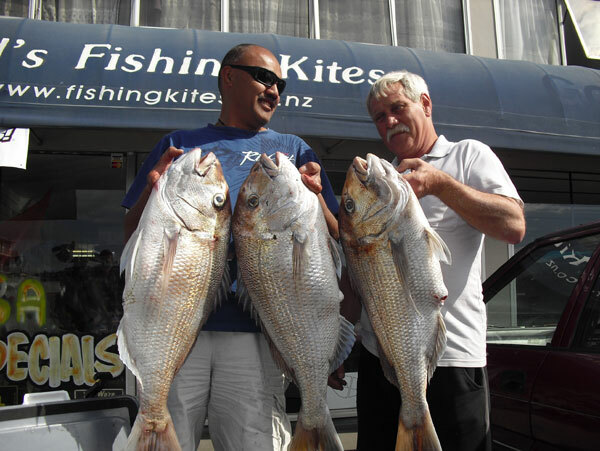 Many large snapper are currently being hauled in by kitefishers fishing the West Coast. Muriwai Beach has been producing particularly well. 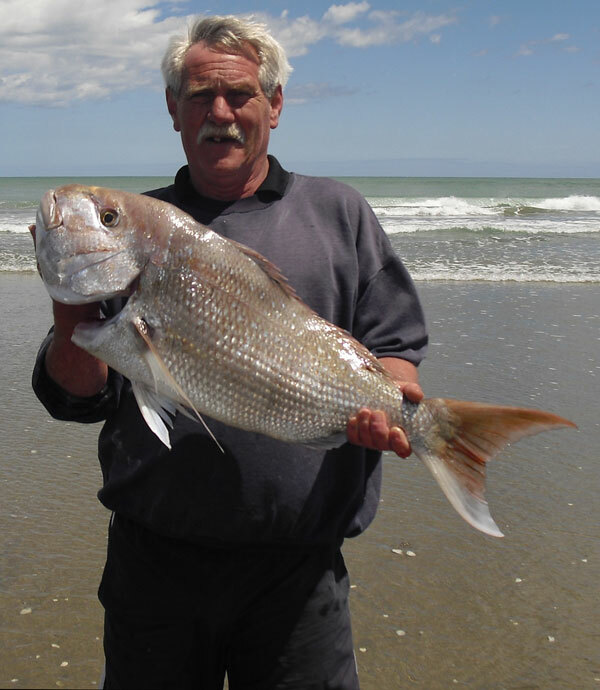 According to Phil Shuker (recently introduced to kitefishing) 90 Mile Beach is delivering red hot fishing. 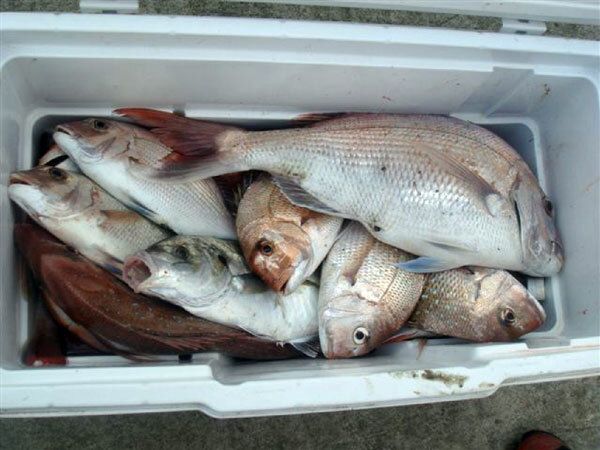 Phil was fishing with a mate on Saturday October 30 and, while running a 65kg Dropper Rig, they managed to haul in seven snapper using mullet baits. Hauls from nearby kitefishers were five snapper on one side and 13 pulled in on the other side on squid baits. Photo Below: Charles dropped in to our shop a few days ago with a very full chilly bin and a grin on his face from ear to ear. He had headed out to Muriwai in the hopes of getting the kite rig out on the promised easterly winds forecast for the day. When he arrived at the beach however there was nothing but a steady onshore wind. Not to be beaten though, he travelled up the beach to Rob’s spot and set out his kontiki instead. The results were amazing! He had caught six snapper, two weighing 14lbs, one at 15lbs and the other three were good sized pannies. He also landed three very large gurnard and two small kahawai. We recently went with Gary Greaves (aka Gravy) on his gravy boat down to the Kaipara. We also had the grand primo of New Zealand, the Right Honorable Sir Malcolm Wottam who was along for the trip as well. We thought we had a shark on but it turned out to be a kingfish of legal size. All in all it was a great day out. Paul's Fishing Systems send a few Flounder Gigging Lights to the USA so we asked a customer for some pics of their flounder species and recieved the following. They are certainlly a lot bigger than the NZ species. I don’t know the length but it is probably about 25 inches and the tackle shop weighed it. Up here we call these big flounder Door Mats. We got nine that night, the fishing regulations here are a bag limit of eight flounder per person with a minimum size limit of 14 inches on the Outer Banks of North Carolina. 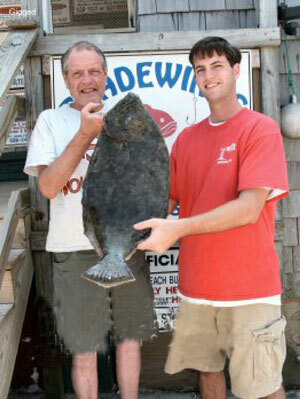 The fish was gigged in Pamlico Sound, near Hatteras. We walk and gig with lights and sometimes the water is murky so your lights will help a lot. Unfortunately my kite has taken a pounding the last two outings. It went into the water on the second set on both days, but both days were very successful in terms of fish. We got four snapper and nine gurnard two weeks ago on the East Coast and one of the snapper was just over seven pounds. Last weekend it was up at Glinks’ Gully. We went home with 18 snapper, 10 gurnard and five kahawai. The first 10 hooks set came back with nine fish and one broken trace. That was an awesome day!!! A Flexiwing Rod and Reel Rig, complete with a Penn 9/0 spooled with 1100m of 80b spectra. This is the ULTIMATE two in one rig. 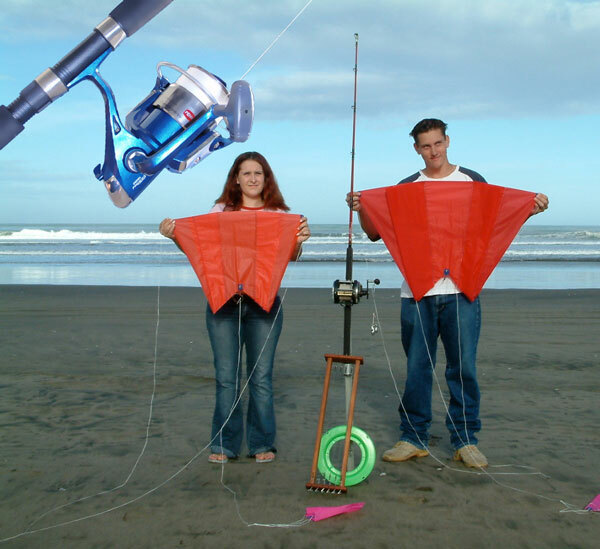 If the winds are right, go kite fishing and set up to 10 hooks per set from either coast. Or, if you are going deepwater or gamefishing from a boat just use the rod and reel. With this versatile rig you will already have the top of the line rod and reel ready to hook into snapper, kingfish or hapuku! All this for just $699.00! A great kit to get you fishing from Boat or Shore! Complete kite fishing kit with a Penn Prodigy 8000 reel spooled with 400m of 30lb spectra mounted on a Penn Powerstick 6602 two piece rod. This rig will get you fishing from shore any time, anywhere! Note: The rod and reel is different than the one shown in the background. It is the combo in the insert that is advertised with this kit. 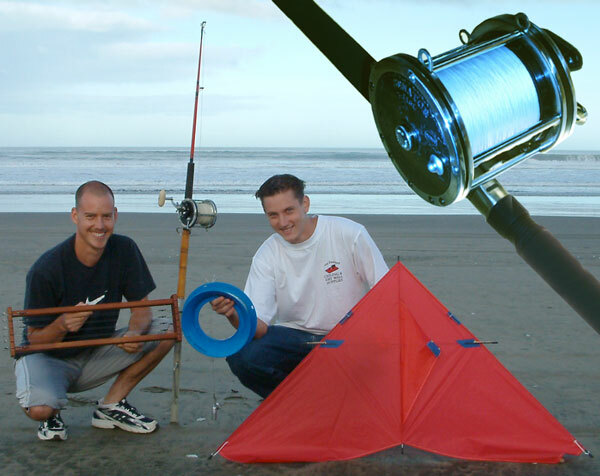 Great set-up for conventional casting from the rocks or wharf, great rod and reel combo for inshore boat fishing for snapper or, use the kites to get you fishing up to 400 metres offshore from the beach! Your Choice! Note: This rod and reel is different than the one shown in the background. See insert in Pic.